Abu Dhabi: After another day when the Rub’ Al Khali (Empty Quarter) teased and frustrated many of the world’s top drivers and riders, Stéphane Peterhansel and Sam Sunderland retained their lead roles in the Abu Dhabi Desert Challenge Powered by Nissan. This still left him fourth overall, with Peterhansel and wife Andrea in a Mini JC Works Rally — second quickest on the day — finishing the leg with a 4 mins 23 seconds overall lead from Dutchman Bernhard Ten Brinke who had a troublesome day in his Toyota Hilux Overdrive. 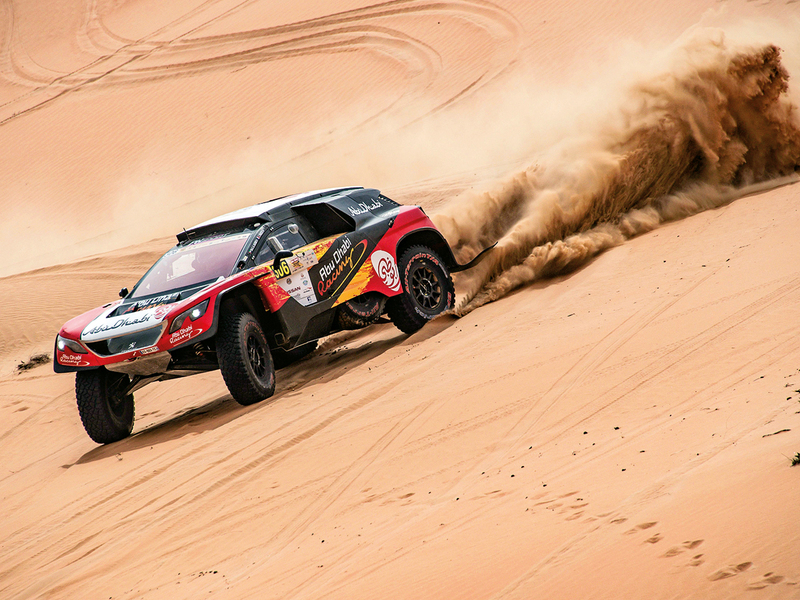 With the UAE’s Shaikh Khalid Qasimi in the Abu Dhabi Racing Peugeot 3008 DKR and Czech defending champion Martin Prokop in a Ford Raptor RS Cross Country also well in the mix, the top five were split by just 15 minutes with two stages totalling 500km in length remaining. The early part of the Nissan Stage trapped a succession of cars in soft sand, and the rally continued to play with the spirits of Saudi Arabia’s Yazeed Al Rajhi. 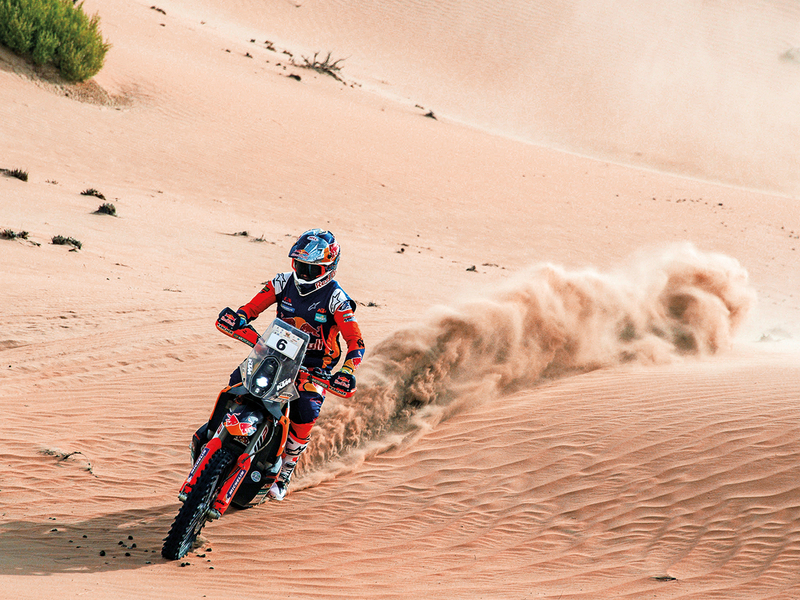 Stranded in the desert with transmission problems on the opening leg, he bounced back to win the next day’s stage, but retired early on Tuesday. Returning to the bivouac he had to wait while engineers assessed engine and exhaust problems before deciding whether his Toyota Hilux could restart on the fourth leg. Sunderland, who has known glory and a fair mixture of frustration in previous years, ended the day with a 12 mins 48 secs lead, although he will not be taking a second bikes triumph in two years for granted. He collected his second stage win in three days, taking it by 2 mins 51 secs from Argentine KTM teammate Kevin Benavides. But it is the younger of the Benavides brothers, Luciano on a KTM, who now lies second, with the winner of the previous day’s stage, Chilean Honda rider Jose Cornejo, in third. “In the middle of the stage there were three of us in one group. We were behind Al Qasimi for a while and we tried to pass. However, he had great pace and we could not make the move,” Stage Three winner Przygonski said. Stage Four, called the ADNOC Stage over 286.10 kms will get under way from 6am on Wednesday followed by the final stage called the Abu Dhabi Aviation Stage over 214.47km on Thursday. Provisional positions after Nissan Stage 3: (Cars) 1. Stephane Peterhansel/Andrea Peterhansel (France/Germany)/Mini JCWorks Rally 11:07:29.0; 2. Bernhard Ten Brinke/Tom Colsoul (Netherlands/Belgium)/Toyota Hilux Overdrive 11:11:52.0; 3. Shakh Khalid Al Qasimi/Xavier Panseri (UAE/France/Peugeot 3008 DKR 11:12:05.0; 4. Jakub Przygonski/Timo Gottschalk (Poland/Germany)/Mini John Cooper Works Buggy 11:13:57.0; 5. Martin Prokop/Viktor Chytka (Czech Republic)/Ford Raptor RS Cross Country 11:22:29.0. (Bikes) 1. Sam Sunderland (Great Britain)/KTM 450 Rally Factory/1 11:00:24.0; 2. Luciano Benavides (Argentina)/KTM 450 Rally Factory/1 11:13:12.0; 3. Jose Cornejo (Chile)/Honda CRF 450 Rally/1 11:13:15.0; 4. Kevin Benavides (Argentina)/Honda CRF 450 Rally/1 11:23:35.0; 5. Andrew Short (USA)/Husqvarna FR 450/1 11:45:00.0.